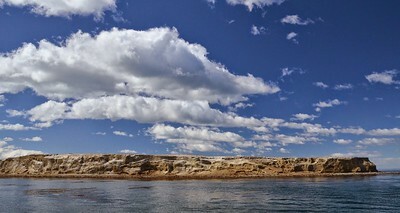 Patagonia has been on our bucket list for many years. We decided that, not getting any younger, now was the time to go.Given that the long term forecast was for an El Nino winter in the western US (low snow and warm temps), we figured we would not miss much skiing. 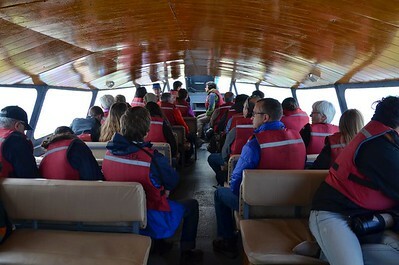 We went with the same company that led our trip down the Alsek River in June, Mountain Travel Sobek. The trip was called "Hikers Patagonia", which basically means you can fight the wind, rain, and sunshine all day, but don't have to sleep in a tent at night. Virtually all of our hiking on the Chilean half of the trip was on the so-called "W" route, in Torres del Paine National Park. 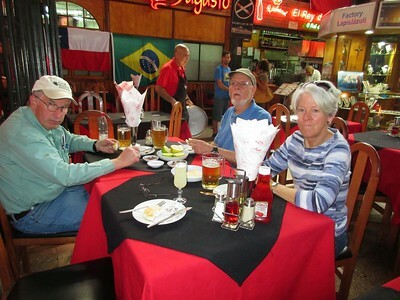 After more than 24 hours in route from Bozeman, we land in Santiago, and enjoyed the fact that we were staying right across the street from the Santiago airport. Not creative, but convenient, practical and close. 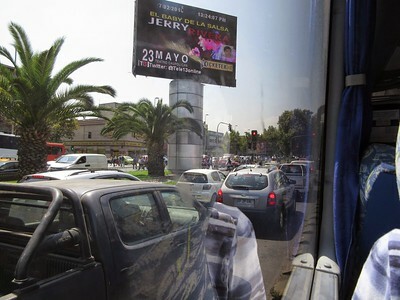 After meeting Andy and Sue, who arrived an hour after we did, we decided to take the bus to downtown Santiago. 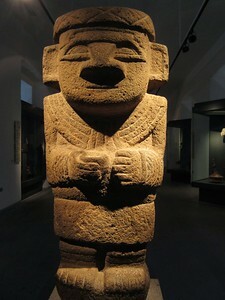 Two things were on our agenda: the Pre-Columbian Art museum and the city Market. Maybe some food consumption as well. 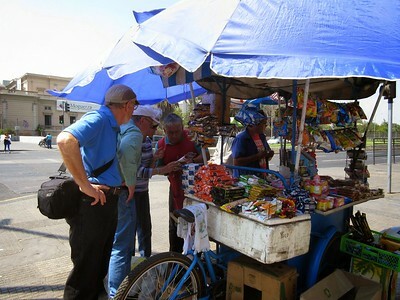 Andy, Roger, and Sue asking a street vendor where we are specifically. 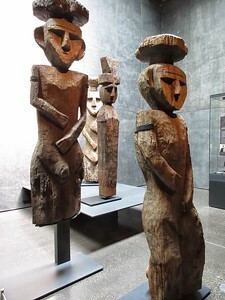 We made it to the museum. I would highly recommend this on a quick stopover in Santiago. We spent about 90 minutes there. After a few blocks more, we made it to the Market. 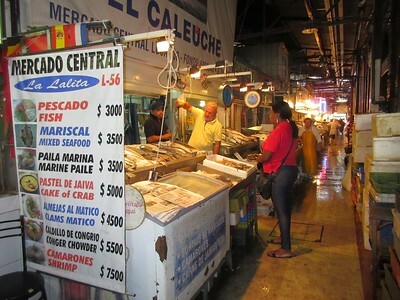 Official exchange rate was about 620 Chilean Pesos to the US Dollar, so the Pescado Fish cost a bit less than $5 US per pound. 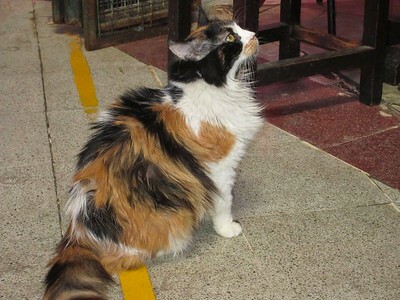 This cat was checking out droppings off plates in the restaurant. 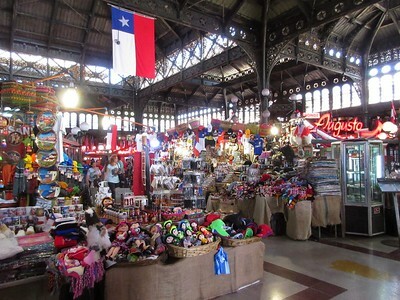 Some of the many vendor stalls at the Market. It's about 4:30 pm, and time for a late lunch, since they don't start serving dinner until 8 pm or so. 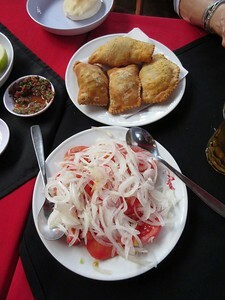 Susie ordered empanatas, as did Sue, and a tomato salad. So, that is the tomato salad, a pile of tomatoes with a bunch of onions on top. 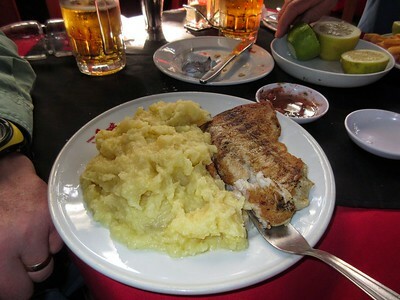 Roger ordered Sea Bass and potatoes. The potatoes were excellent. Probably had a stick of butter in each serving. 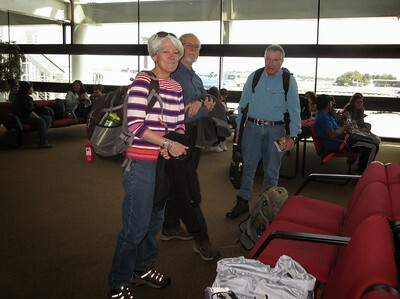 Susie and I had a refundable ticket to Punta Arenas, so we moved our flight up to be on the same plane with Sue and Andy. 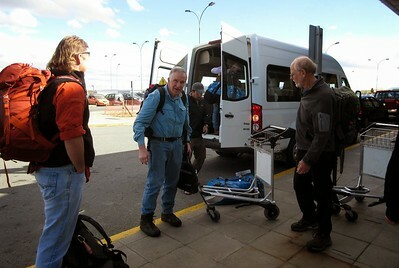 This turns out to have been way more convenient for the people meeting us in Punta Arenas. 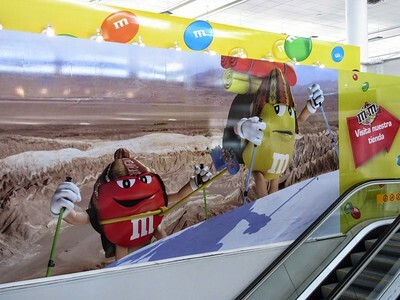 M&Ms are hugely popular, but we did not see any dark chocolate M&Ms. Things were not flavored intensely in Chile. 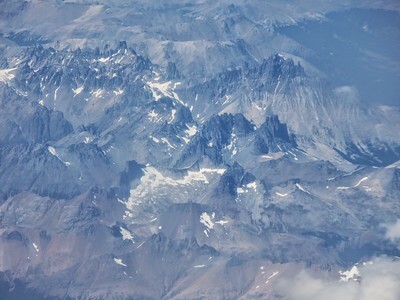 View of some Andean peaks out the window of our plane. 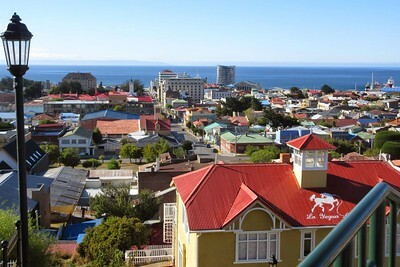 Punta Arenas lies on the Strait of Magellan. It lies at 53 degrees South Latitude, about as far south as the north end of Jasper National Park in Alberta is north. 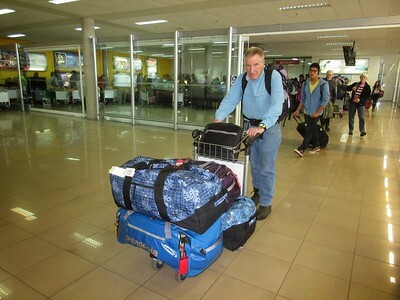 MT Sobek was happy to pick us up earlier, since it saved them another trip back to the airport, which is a fair piece outside of Punta Arenas. 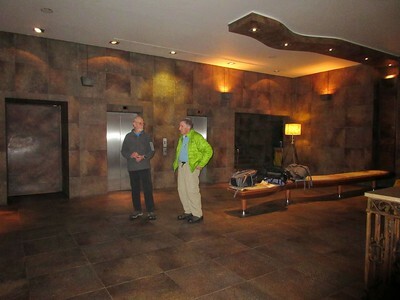 That is Jim, on the left, the nephew of one of the "Atlanta Boys" Andy is on the right of the photo. 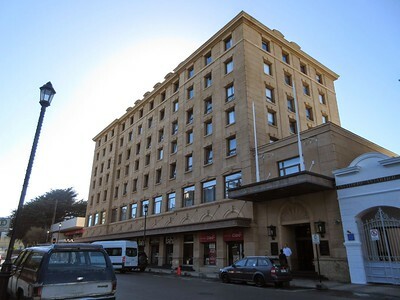 Hotel Cabo de Hornos. 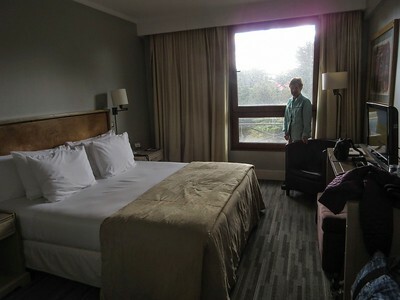 Very nice place and right across from the city square and park. It turns out that Saturday night, it is "Party On, Dude" ALL NIGHT!! The four of us, Susie and I, Sue and Andy, took a long walk that evening, down by the waterfront, and then looking for a place to eat. These two dogs seemed pretty intent on the water. 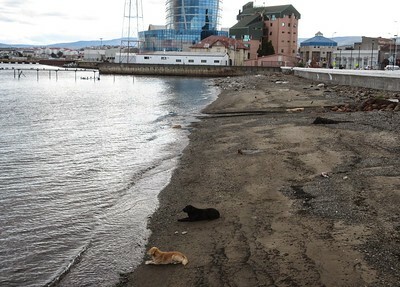 Maybe they were waiting for a shore bird to swim close enough to be their dinner. BTW, the glass and steel building in upper center is a new casino hotel. 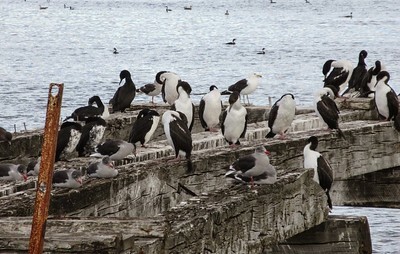 The birds with the all-white chests are Imperial Cormorants. 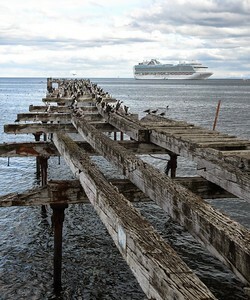 Lots of birds, but note that cruise ships have discovered Punta Arenas. PA does not have a harbor sufficiently deep for the big ships, so they shuttle their passengers in. 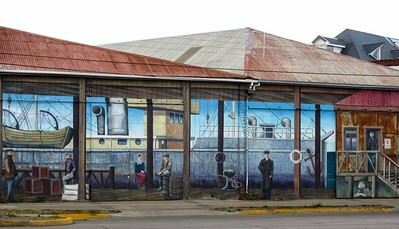 Several of the buildings down on the waterfront had murals on them. This was a particularly good one. 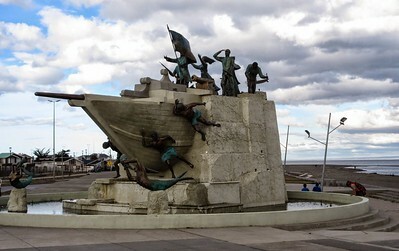 A statue memorializing local maritime history, including Magellan's sailing thru this strait, is relatively new. Next morning, we got up very early. Three of us (Susie declined, since she does not do well on small boats in big water) we set to leave at 6:45 am to be taken out into the Strait to view penguins on an island that is one of Chile's National Monuments. We never got the message that the pick up had been moved until 10:15 am. Meantime, Susie went for a walk around town. 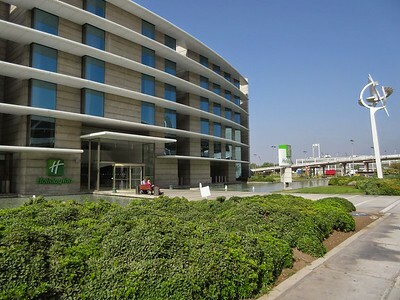 Here is the hotel in which we are staying. 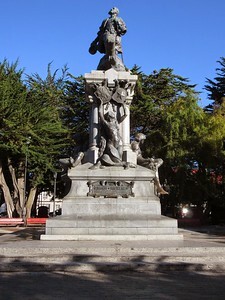 Across the street from our hotel is the memorial to Ferdinand Magellan. Susie climbed this hill to get an overview of the nearby city and a view across the Strait. Meantime, Solo Expediciones FINALLY got their act together, got us out to the little dock they use for their covered 35 foot long Zodiacs, and we headed into the Strait. 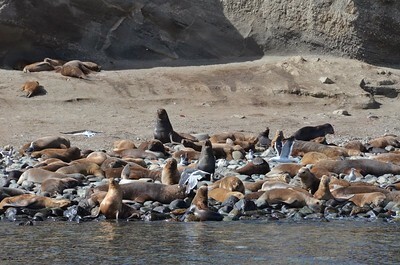 First stop was after a 45 minute run, to float off an island which has been taken over by sea lions. Tremendous numbers, and there were quite a few big bulls. Humans are not allowed to land on the island. OK, the cormorants have the mezzanine level. 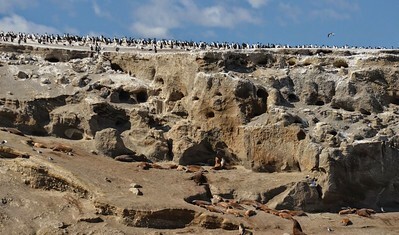 The island is not big, but there is a lot of life there.